The unique colors and patterns found in concrete acid stained floors come not from paints or coatings but from a chemical reaction, which takes place after applying the staining solution. Staining gives concrete floors rich, luminous tones that other flooring and coloring mediums cannot match. You can choose acid stains that mimic the look of marble, natural stone, leather, wood, and other surface types. The product is durable, versatile, and simple to maintain. Concrete acid floor stain causes a chemical reaction between the staining solution – acid, water, and inorganic salts – and the minerals naturally found in concrete. This reaction creates the earthy tones typically found in concrete acid staining. The solution works on both old and new concrete, as well as on both interior and exterior surfaces. The staining process creates a mottled, variegated look rather than a uniform color. The color even varies from one concrete slab to the next, creating different patterns. Mixing available covers creates different shades for even greater variety. If you are looking for durable flooring, concrete acid stain is an ideal choice. It is long lasting, and the application of a sealant offers even more protection. This durability even holds up under many types of water damage. On the health front, households with allergy sufferers appreciate concrete acid stain floors, which resist the dirt and debris often found with carpeting. They are also a great choice for pet owners, as cleaning “accidents” is a snap. Of course, one of the main selling points for homeowners is the numerous of design possibilities. There is a wide variety of acids from which to choose, each creating its own wide range of hues. You can also create patterns on the concrete with the acid, adding yet another level of variety not found with traditional flooring choices. Another variability factor exists in the range of applications. Concrete stains hold up well against UV rays, making them an ideal choice for exterior locations such as walkways and patios. Indoors, you can stain floors, countertops, even walls. The variety of design possibilities is fantastic. There are two main concrete stain types: acid-based and water-based. Acid-stained usually consist of a mixture of water, hydrochloric acid, and metallic salts. This solution penetrates the concrete’s surface and reacts with the calcium hydroxide (commonly called lime) naturally found in concrete. Once this reaction occurs, the concrete is permanently stained, meaning it does not fade, peel, or chip off. Acid-based stains result in earth tones: browns and tans, terracotta, and blue-green. Water-based stains come in a much broader palette of color choices, literally dozens of choices. These are typically an acrylic blend and create the same permanent result as their acid-based counterpart. Despite the permanent nature of concrete staining, it only penetrates concrete’s top layer. Over time, traffic and exposure wear away this surface layer. Protect it with a clear sealant to make it last longer. Also, clean it using a dry dust mop. You can occasionally use a wet mop, but choose a neutral-pH cleanser. Additionally, a commercial-grade floor wax designed for concrete floors protects against stains and preserves the sealer. Note that saw-cut patterns tend to trap dirt, making it more difficult to keep the concrete clean. Using floor mats and area rugs further protects high traffic areas (and keeps toes warm). Talk to your contractor for a complete list of concrete stain-safe cleaning products. Although aged concrete presents no challenge to a concrete acid floor stain, damaged concrete does. Preferably, the surface should be smooth and undamaged to properly absorb the stain and create the most attractive look. Worn or damaged surfaces, such as spalled concrete or an acid-etched surface, do not take the stain as well. Preparation is important, although this varies depending on the state of the concrete and its age. New concrete must cure for at least three weeks after pouring, and then be rinsed and scrubbed before application of the acid stain. Older concrete needs thorough cleaning. Look for anything that would prevent the acid from reacting with the concrete, such as curing agents, dirt, grease, paint, and sealers. It is best to perform a test application on a small, inconspicuous area first. Concrete staining is not an ideal DIY project. For optimum results, hire an experienced, licensed contractor. Preparing the surface, especially, requires professional equipment. The staining process itself is also not a simple matter. Understand that choosing concrete stain represents a significant investment. Concrete acid stain creates a unique, striking appearance that lasts for a very long time. Between color and pattern variations, your design choices are nearly endless, and you can apply it to interior or exterior concrete surfaces (or both!). Maintenance and cleaning are a breeze. 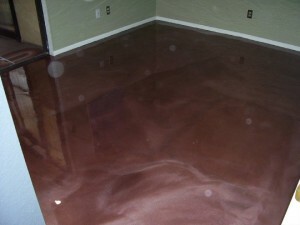 If you are looking for attractive, durable, unique flooring, you will have a hard time beating concrete staining.